The Cinnamon Syrup Recipe Revealed! 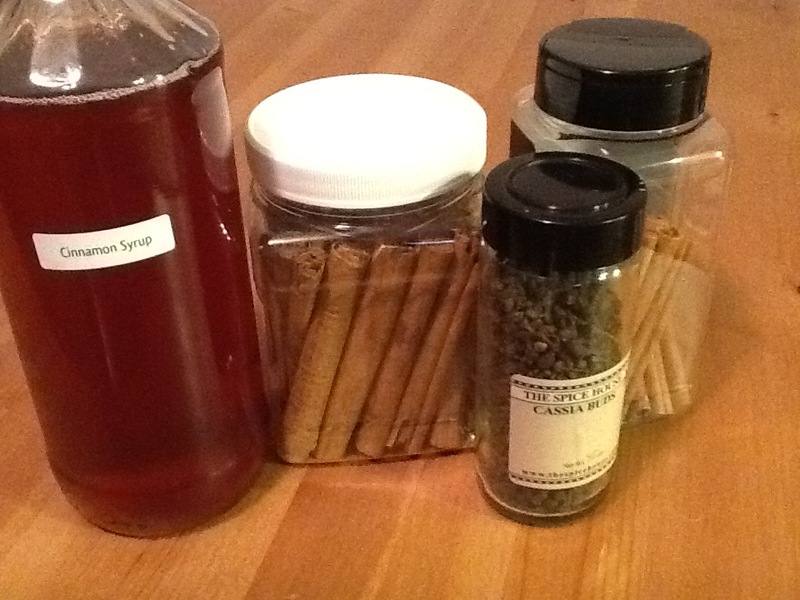 Above, from left to right; my cinnamon syrup, dried bark of Cinnamomum verum zeylanicum (true cinnamon from Ceylon), dried buds of Cinnamomum cassia (common cassia ‘cinnamon’), and dried bark of Cinnamomum cassia. Many attendees of the shorter Elemental Mixology courses and classes have asked me for my recipe for my ‘triple cinnamon’ cinnamon syrup. I have usually replied that the recipe is divulged and the syrup made during the Ingredient Fabrication Course. 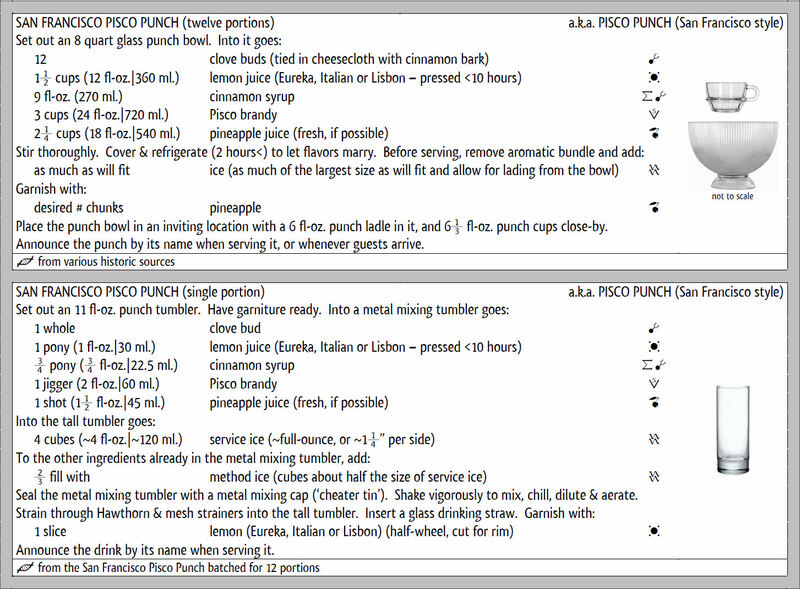 But, many people just don’t have the time to take that course and want to make the excellent San Francisco Pisco Punch that was made in the course they have attended. Pour 750 milliliters distilled water into a saucepan and bring it to a boil. Turn off the heat. Place the saucepan over the lowest flame possible, cover well and simmer for several hours. After at least two hours, remove from heat and strain out the solids through a chinois-type strainer, and then through a coffee filter. Weigh the liquid infusion. It should weigh about 600 grams. Add the same weight in fine, white sugar and whisk until dissolved. Pour through a funnel into a one-liter bottle, which should be right about the entire yield. Cap and label and store in a refrigerator. 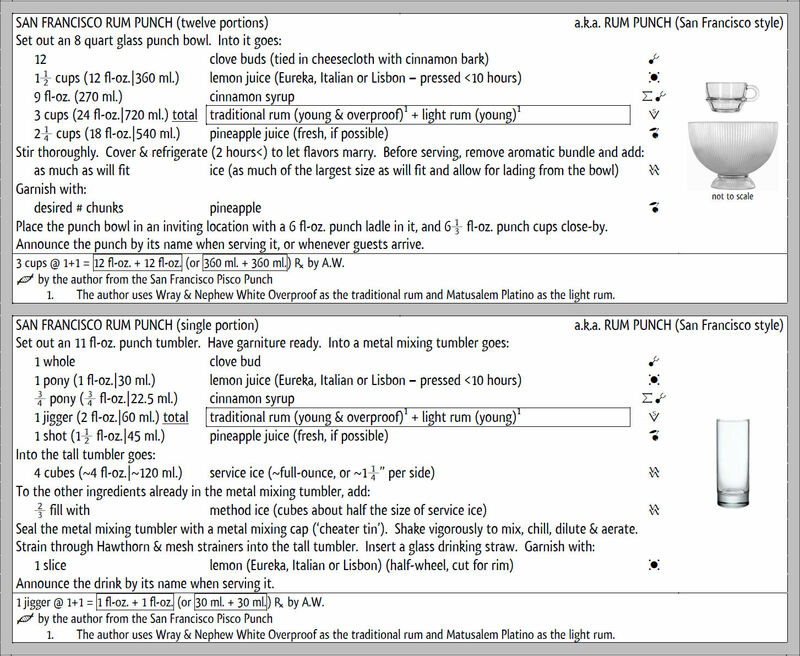 Use the syrup over vanilla iced cream, or in a San Francisco Pisco Punch (below) or a San Francisco Rum Punch (scroll all the way down), or in any other spirit version! San Francisco Rye Punch is good, too! Do you remember this label on a jar of cherries? Some of you must. I remember it very well. 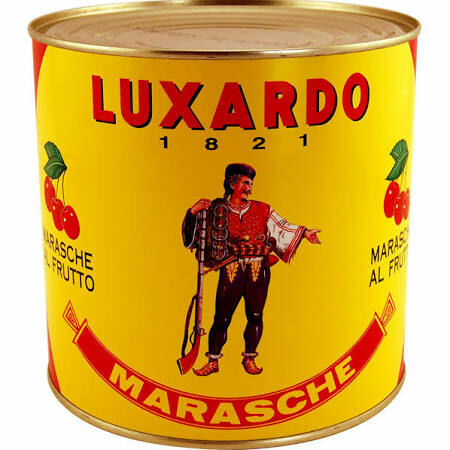 There was a time when I used to tell my students how nice it was that Luxardo didn’t try to sell their lovely marasca cherries with any lie that they were somehow maraschino cherries. The label simply, and correctly, identified the product as marasche — plural in Italian for marasca. 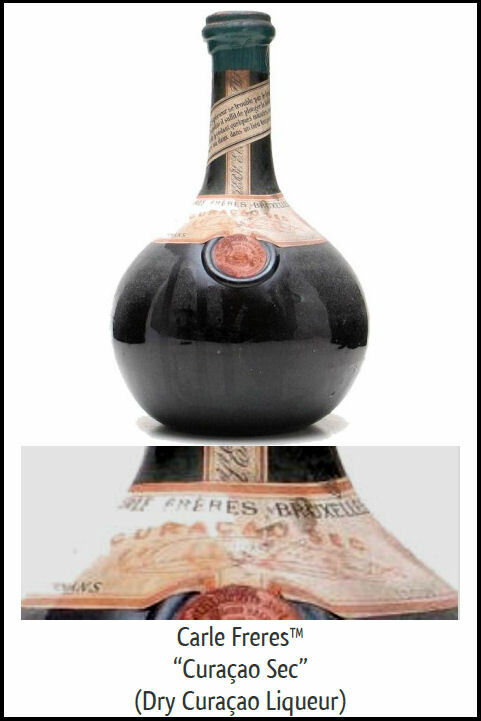 The label also stated that the product consisted of marasca cherries in a pure, marasca cherry syrup. I recall how I would praise Luxardo’s integrity versus the shameful lie on the label of any so-called “maraschino cherries” found in an American supermarket. That simple, obvious standard would mean that there is no such thing as maraschino cherries in the world today — at least not commercially-available ones. Dear reader, you have never had a true maraschino cherry. Over the years, I have toyed with the idea of taking some of Luxardo’s marasche, rinsing the syrup off of them and placing them in a jar and then covering them with Luxardo’s maraschino liqueur. But, for the liqueur to really permeate the cherries, I expect they would have to be fresh — not already saturated with heavier-than-liqueur syrup. I have never been willing to spend so much money to try something that common sense tells me would not yield anything like the correct result. The good, old standard (and the governmental body that set it) is long gone. 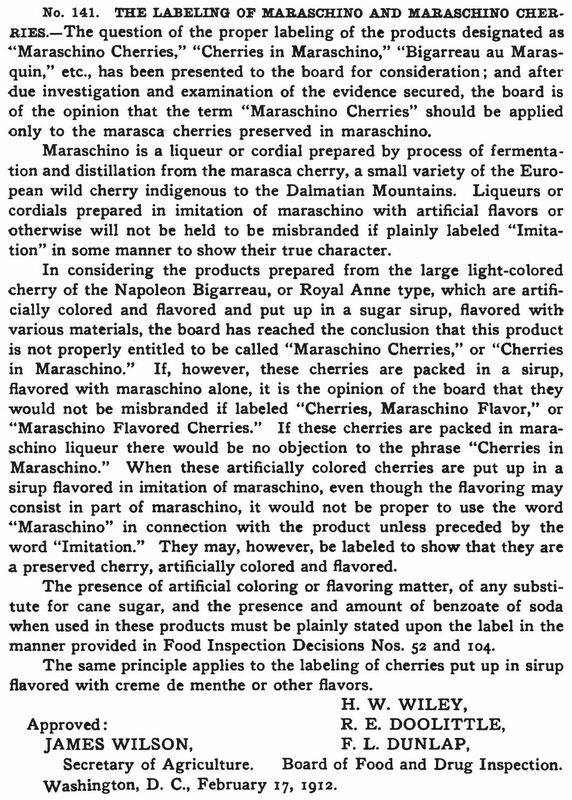 Now we have so-called “maraschino cherries” that are not marasca cherries — nor cherries of any type preserved in maraschino liqueur. 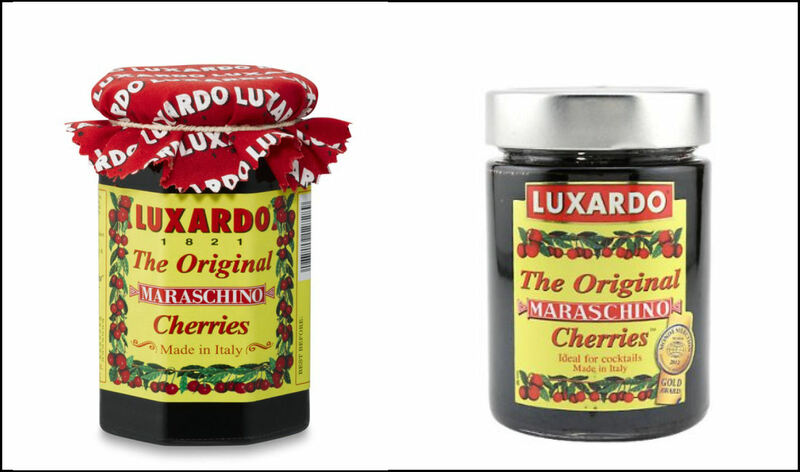 Luxardo’s cherries really are marasca cherries, so it was understandable that they would want to cash in by joining those that had been stretching the ‘maraschino cherry’ truth for so long. Though I understand the financial motivation behind it, I find Luxardo’s labeling change to be vulgar and distasteful. I wish, instead, that Luxardo had brought to market some true maraschino cherries. 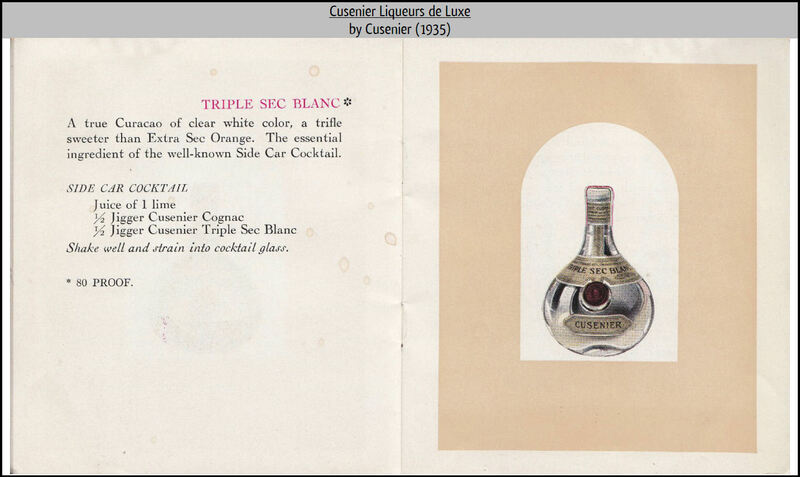 They would have been expensive — their marasca cherries in syrup already are so without the inclusion of maraschino liqueur. I imagine that the cherries preserved in Luxardo’s good maraschino liqueur might have cost a lot more money. But, I would have bought at least a couple of jars. Plenty of our nation’s more pretentious drinking establishments would’ve have made an ostentatious display of using them. 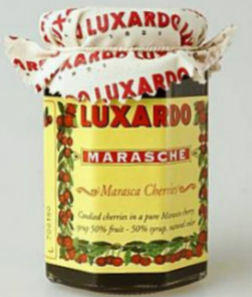 Luxardo could have sold both marasca cherries (marasche) and true maraschino cherries. But why bother when a little lie is so much easier? Luxardo’s marasche are very good — even when called something that they are not. Who would ever know the difference, anyway? Well, you do — now. Surfin Curaçao liqueur may be of any of several grades for sweetness, and intensity of bitter orange aroma. 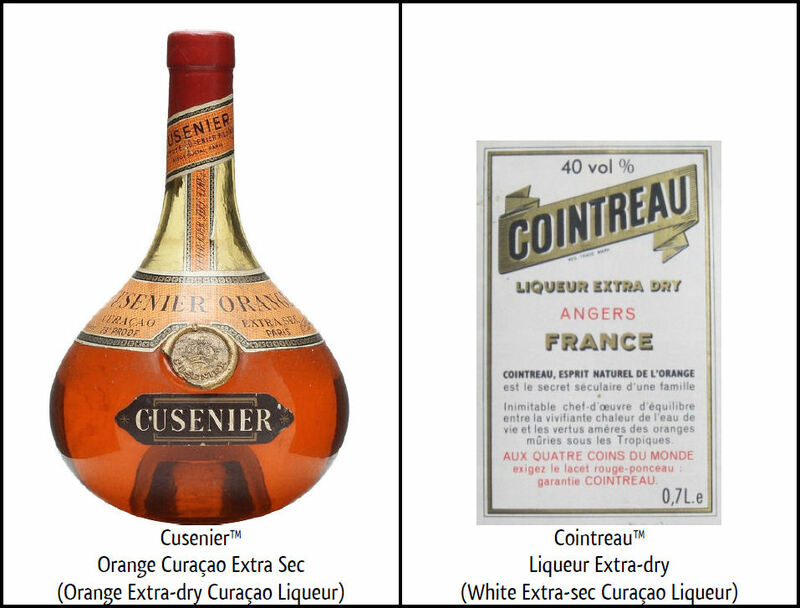 The sweetest and most bitter grade of Curaçao liqueur is doux (French for ‘sweet’). 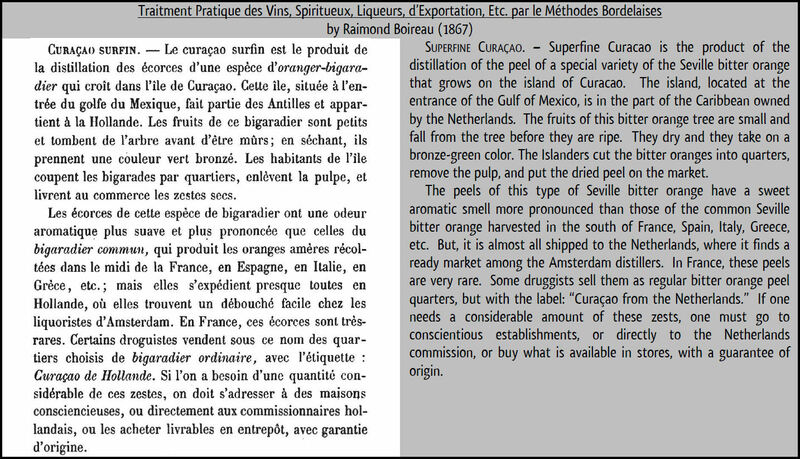 No Curaçao doux liqueur seems to be commercially produced anymore. Less sweet than Curaçao doux is Curaçao sec. 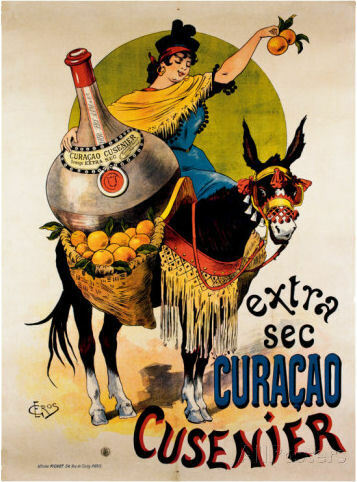 Sec is French for ‘dry.’ Early French Curaçao liqueurs were very sweet, and Curaçao sec may have been created as a later adaptation toward the original type from the Netherlands. 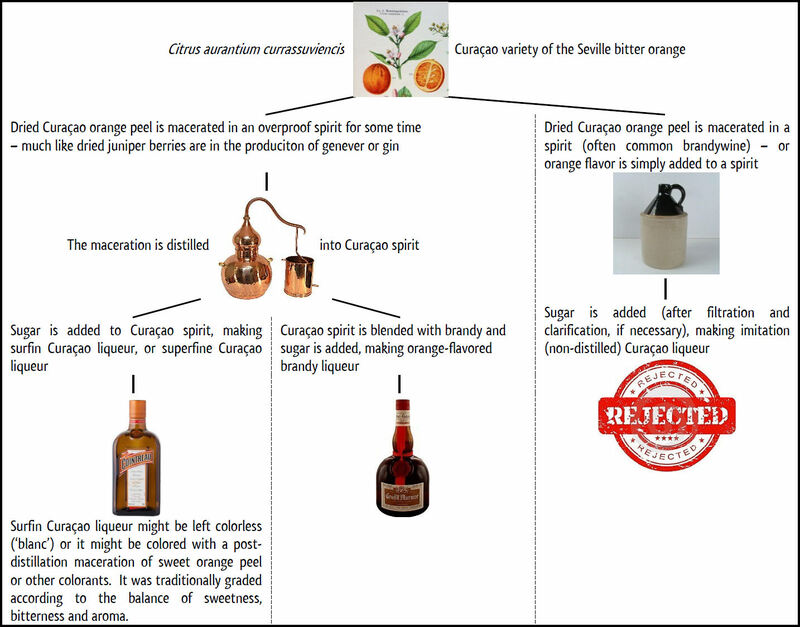 One way to allow for the use of less sugar was to use the zest and peel of three types of oranges — usually Curaçao, Seville and common sweet — to mitigate the bitterness associated with using only Curaçao oranges. 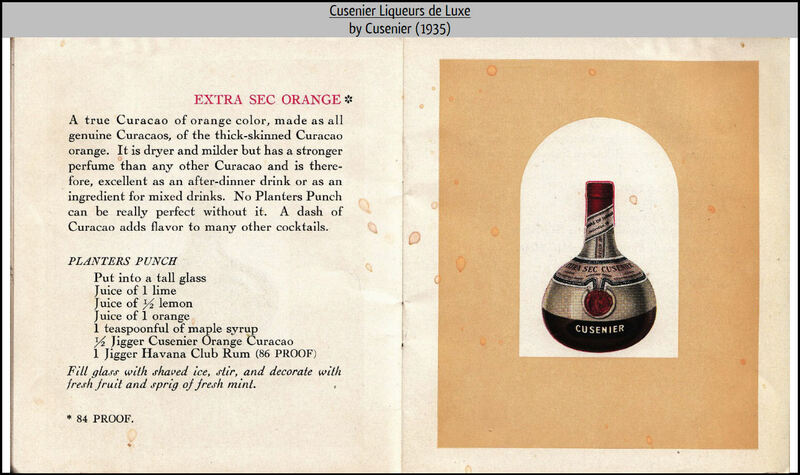 This is the meaning of the descriptor “triple orange” found on the pre-‘grand’ product by Marnier, Curaçao Marnier. 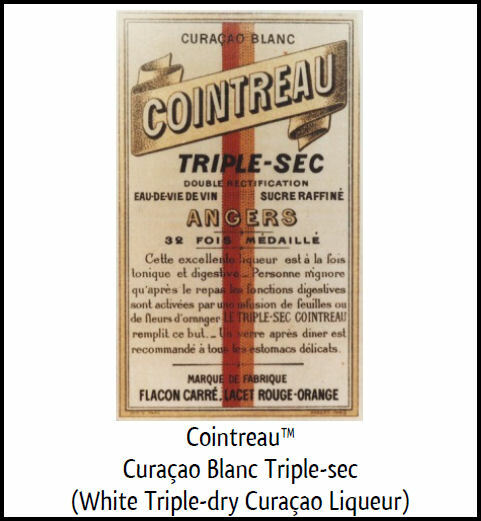 When a Curaçao liqueur is both ‘triple orange‘ and ‘sec‘ it is called in French, Curaçao triple-sec.